With spring on the horizon, it’s time to consider your go-to trouser options for the season ahead, get better acquainted with the styles available and, in due course, exchange those skinny jeans for legwear befitting of a man whose finger is pressed firmly on the sartorial pulse. But with so many trends and updates emerging from London Collections: Men (LC:M) and the European men’s fashion weeks over the past month, where do you start? Sure, the stuff sent down the runways is set to be big for AW15, but some of us are early adopters and want to get ahead of the pack by pulling on these threads now. With this in mind, we’ve created this brief guide to the five freshest trouser trends that are set to take off this year. Topman Design threw down the gauntlet at last month’s LC:M by sending its models down the runway in 1970s rock-inspired looks, which included exploded kick flares and powerful bell bottoms. But if the thought of pulling on a pair of lavishly proportioned flares leaves you cold, there is another, more palatable way to tap into the trend: wide-legged cuts. Championed by luxury labels Marc Jacobs, Raf Simons, and E. Tautz, the wide-legged trouser has been rescued from sartorial obscurity and is set to go mainstream this spring. When it comes to styling, try playing up to their relaxed nature by dressing them down with a pair of minimal trainers and SS15’s key outerwear silhouette: the bomber jacket. Pale Grey Wide Leg Trousers, available at whistles.com, priced £50. The sartorially-attuned among you will have clocked the rising popularity of checked suits and separates. High-end brands such as Dolce & Gabanna and Tom Ford have refreshed their tailoring for AW15 with a distinctly British feel by using Prince of Wales and windowpane motifs in sophisticated hues and luxurious fabrics. It’s a trend that has already filtered down to the high street, with the likes of River Island, ASOS, Topman and Burton currently stocking some excellent options in brown, grey and blue colour ways. Try teaming them with a sharp polo shirt and pair of loafers this spring/summer for a solid smart-casual look that is able to transcend from day to night. If it gets chilly, you could always throw a linen blazer over the top, too. Check Slim Fit Formal Trousers, available at burton.co.uk, priced from £25. Despite the fact that cropped trousers gave rise to the ridiculous term ‘mankles’ (how an ankle can be gendered, we’ll never know), the style is set to continue where it left off in 2014. Although shorter cuts have trended for several seasons now, this year’s cropped offering has been given a fresh twist via some seriously natty prints and patterns, which cannot fail to make a statement. ASOS are currently stocking a selection of sharp styles in classic neutral colour ways, along with some more attention-grabbing options. Super Skinny Fit Cropped Trousers, available at asos.com, priced £18. If you think sweatpants are for people who have given up on life, then get that dirty, slanderous thought out of your head right now. Sweats have undergone a serious image upgrade in recent years, and have fast become our tapered, streamlined friend. It’s time to resurrect the structured sweats you bought last summer – they’re still relevant ­­- or bring your wardrobe bang up to date with a smart, slouchy pair from the likes of Whistles, Acne or Wood Wood. Despite them being more versatile that you may initially think, slimline track pants are still best paired with sports luxe staples – think bomber jackets, longline shirts/tees, boxy sweatshirts and minimal leather trainers. Ideal for running errands or relaxed weekends. Navy Skinny Sweatpants, available at riverisland.com, priced £30. 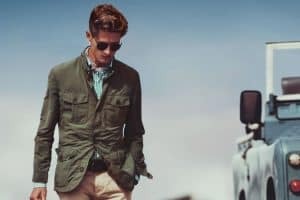 Clothes with a military heritage are nothing new, but there’s more to the latest army-inspired trousers than the bulky cargo pants of old. We’re ushering in an era of cool, grown-up military styles in sumptuously soft fabrics. Suitsupply’s cargo trousers (below), for instance, have a utility feel, but the soft, brushed cotton fabric and slim, tailored cut turns them them into a genuine smart-casual option that can be dressed up or down with ease. Elsewhere, Vans has given the chino a new season update in on-trend camouflage print, making them a welcome addition to any man’s off-duty wardrobe. Blue Cargo Trousers, available at suitsupply.com, priced £129.